It wasn't easy for Mary Yusufu to get her voter card. The electoral register in Africa's most populous land now contains more than a record-breaking 84 million names. But Nigerians who want to vote need a lot of time and patience. The Independent National Electoral Commission (INEC) has three administrative building complexes in the capital Abuja. Everybody working there is very busy. 84 million Nigerians are called upon to elect a new president and parliament on February 16. State parliaments and gubernatorial elections will take place two weeks later. Sitting in his office in the capital, INEC's deputy spokesperson Aliyu M. Bello is happy with the way things are going. "The commission is ready. It has been engaging with critical stakeholders and prepared the voters' list. So far arrangements for everything pertaining to the 2019 election are excellent," Bello told DW. Preparations for the elections are an enormous logistical challenge. The number of registered voters is the highest ever. 774 districts will host almost 120,000 polling stations. All of them will have to be provided with material and personnel in time for election day. Jude Udo Ilo has serious doubts about the feasibility of this. "There are reasons to worry. For instance, one month before the election, the recruitment and training of the staff have not yet been completed," the director of the regional chapter of the Open Society Initiative financed by the US billionaire George Soros, said. It is far from certain that the material will be shipped to the country in time to be thoroughly scrutinized for errors. "We are not very clear on how INEC is approaching all of that activity." These are not the issues that worry Mary Yusufu. 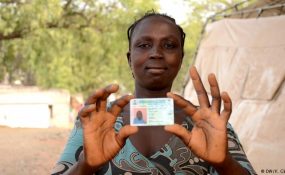 The 34-year-old mother of seven, who has been living in the federal state of Adamawa, bordering Cameroon, for the last four years, had enough trouble in the last few weeks just trying to get her voter card. Unlike other countries, in Nigeria you don't need a new voter identification document for every election. But Mary Yusufu's card was burned during her flight from the terrorist militia Boko Haram, she says. To get a new one, she had to stand in line a total of six times. "Four times I went to the school where registrations were taking place," she told DW. "But they kept sending me away, saying I was too old." She was finally successful at a different registration center. Mary Yusufu will only be allowed to cast her vote for a presidential candidate. "The framework establishes that those IDPs (internally displaced people) living in other states than their own state of registration can vote only in the presidential election," Aliyu M. Bello explained. IDPs living in the state they are registered in can also vote at state level. Jude Udo Ilo criticizes the system. "We worry about the fact that citizens of Nigeria are going to be disenfranchised from participation in the election through no fault of their own. We hope that all interested parts will focus post-election on working out a system that allows us to exercise our political rights," he said. This is not an important issue in Nigeria. According to the UN Office for the Coordination of Humanitarian Affairs (OCHA), 1.8 million IDPs now live in the northwest. In other federal states, tens of thousands of people have had to abandon their villages because of land conflict, riots and marauding bands. In theory, voters can re-register when they move to another polling area. But there are reports both from Abuja and Yola that some voters are now doubly registered and own two voter cards. None of the people in question wanted to comment openly. But one man told DW that it was easier to request a new card than to register a new place of residence. He was adamant that he would not cast his vote twice. Samson Itodo, director of the local NGO Yiaga, worries that this kind of incident raises the question of credibility of the electoral register and the ability to fight fraud. This could damage the INEC's reputation. "There is a probability that stakeholders will lose confidence because they will think that this is rampant, even if it is isolated," he told DW. The INEC also has voter cards that have not been claimed. According to spokesperson Bello, they are securely kept under lock and key until the rightful owner collects them. "Abuse? No way. The commission is taking good care of all the cards that have not been collected. In fact it keeps a good account of voter cards that have not been picked up," he declared. But he couldn't say for how long the cards are kept after being issued. Although one thing is clear: "The cards are not destroyed." For voters, security is another important issue. Only voters who feel secure will go to the polling stations. 68-year-old Mathew Musa agrees. He fled to Yola from the district of Madagali, taking his voter card along with him. That means that he will have to return to Madagali to cast his vote. The fare for the four-hour drive is around 2,000 naira (€4.83, $5.49). He has made up his mind: "If we get security, we will go."